Yes. Our country is in crisis. What can we do about it? As I sweat it out on the treadmill, watching the latest stories run across the screen, I tend to get disgusted by the flashy but inconsequential, limp responses to the crises: polemics, marches, demands for tougher laws, and ‘vote the bums out’ just to name a few. I sense growing hopelessness as these crises hit faster, closer together and strike at the foundations of our way of life in America. Many of us, including many of those who do not know the Lord Jesus Christ, wrestle with these feelings. That many of these crises are heavily politicized only complicates a clear understanding of the problem and the solution. At their core, these national crises exist because they were individual crises first. This is where I am focusing my comments in this article. What hope do WE have? What can WE do to purvey that hope to people around us? As Christians, we know exactly what the problem is in each of these crises: man’s sinful, glory-gobbling heart at war with his Creator—a war that has only one lasting solution and we know what that is: redemption through our Lord Jesus Christ! Man’s “solutions”, however, tend to be heavy on symbolism and light on substance, weak on long-term effectiveness and therefore usually have the effect of eroding hope for and confidence in any solution, especially the only effective solution. In saying all of that, I do not mean to be simplistic. I am simply cutting to the chase. Obviously, our problems are usually complicated and require long-term, practical attention. But real hope ultimately comes from matching the core problem with its real solution. The often long, rocky, uphill road of lasting change is guided by clearly defined hope that addresses the real problem. Are We Part of the Solution? Tragically, we can forget the Good News and its power to change lives. When we do forget, it is not long before we ourselves get sucked into the vortex of fear and vitriol. Worse, it keeps us from seeing—and entering into—the suffering of individual people many of whom live right next door to us. Perhaps the crises on T.V. don’t touch them directly, but they don’t have to. Indirectly, they tear away at a sense of security that undermines their confidence as they struggle through their own—crises. Our elderly neighbors have lost their health. Their son who is dealing with job loss and is physically limited by a chronic back condition. He has been commuting from two hours away each weekend to clean and shuttle clothes and meds to a rehabilitation facility where this couple has been now for eight weeks. By worldly standards, the future is not looking too good for this family. Gut-wrenching decisions are ahead. Incredible sacrifices will have to be made. Much of what this couple built for 40 years of marriage will likely be lost. There is fear and a lack of hope. So what is one to do? We have sought to minister hope explicitly and practically by helping with late night errands and visits. We have prayed with the son and his parents several times for wisdom, financial provision, and healing. We seek the right opportunity to share God’s plan of salvation more completely. In the meantime, we try to season our conversations with a few carefully placed reminders of God’s truth; his goodness and his work even in distressing situations. We have had him over for some meals when he was in town. During these meals, we learned about him and his family. An auto mechanic, he very graciously helped us with some needed car maintenance. Do WE Remember Our Hope? I do not believe in coincidences. I have great hope that God is doing something powerful in this family. In some very simple puny ways, moved by the love Jesus continues to show us in our own mess, we have the privilege to be part of what God is doing in the story of this family. But our focus has to be on the hope: the confident assurance that guides even though the circumstances appear hopeless. Brothers and sisters! We have hope! Yesterday we celebrated Easter, we wore our Sunday best and watched our children hunt for eggs in the backyard. What did we celebrate? What does Easter represent? Victory! We know a completely triumphant, risen Savior! We have confidence! We need to act with the confidence that comes from the certainty that we know the fundamental problem and its solution. There is no guesswork here on our part. Consider that. God has said that we are his witnesses. This is real encouragement for us and for others who may not know Jesus. The infallible Scriptures tells us this. 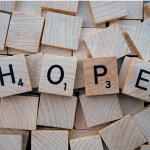 We have a unique and blessed opportunity to speak of hope with confidence to people who are watching the same news… and are likely looking for some answers beginning with hope. Do not be swept away in the fear and hopelessness of the headlines. Remember the victory that is ours in Jesus Christ. Get to know your neighbors and ask about their struggles. I find that people are usually quite willing to share. Pray with them about their concerns. Pray for them as a family. God is good. God is sovereign. We can trust that God delights in bringing redemption through challenging situations. Be intentional with your neighbors and the crises they are dealing with. Enter into those with them with the power and hope of the Gospel that is secured by the resurrection we celebrated this weekend.